I just returned from walking in the rain. I do not own an umbrella...unless I am going somewhere important, I would just as well have my clothes wet than dry. On my way home I was thinking about creative impetus...the stimuli that spur us to create. I think that some artists thrive in a chaotic environment, they like to be upheaved and this is the genesis of paintings, poems, songs. Others I am sure receive their inspiration from serenity, from a more pacific attitude regarding their art. That is the beauty of creativity...it is inherently unpredictable; we never know when it will strike. On the calmest of lakes or on the edge of a tempest, the spark that makes us want to put paint to canvas is so wonderfully unique. So which one are you? Do your ideas come as a result of solitude, peace, inertia, absence of thought? Or, are you inspired by energy, activity, change and chaos? I am sure that we are all a combination of the two extremes, yet I do believe that the pendulum swings more to one side within each of us. My ideas for paintings occur usually as a result of some sort of transaction....of energy, exchange, activity. On the treadmill the other day two compositions came to me and I had to remember to sketch them down after returning from the gym. Oxygen to the brain perhaps fosters their creation. Engaging discussions help bring ideas out into the open as well. Others' opinions, either in agreement or disagreement create a conduit which can help us oil our creative cogs. Whether you are an artist or not, ideas are by nature fugitive. They tend to drift away unless we capture them on a notepad or in a sketchbook. I make a habit of having some sort of recording device with me at all times...heck, even for this blog I will be out at a coffee shop and need to grab my notepad to jot down something to hash out here. I am really enjoying delving into the subtle skin tones of the current painting on my easel, "Jade, Waiting". I am about 80% complete it and happy with it's progress so far. 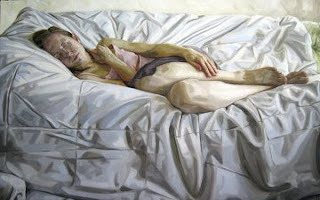 It is all about all forms of waiting, not just the obvious (which will be obvious when you see the painting). Mixing colour and value is such a joy, and it is one of the reasons I enjoy oil paint so much....it is very forgiving. It will always dry. It is like a clean slate that you can go and make mistakes on (within reason) and it will continue to allow for revisions and corrections. There are so many dark ochres, deep oranges and raspberry hues within Jade's skin. I love working with colour that has something to say and doesn't beat around the bush. Listening to: A Case Of You by Joni Mitchell I never liked Joni Mitchell before, but this song changed my opinion of her. Watching: Waterworld. I wish I could say I lost a bet, but I haven't. I'm watching it because I think it is on many 10 Worst Movies Lists out there, along with Ishtar and Plan 9 From Outer Space. Though have you tried to sit through a viewing of Battlefield Earth? That makes Waterworld look like a cakewalk.